In 1997 Tree　Climbing Japan was founded by John Gathright with the dream of helping a very special parapeligic lady leave her electric wheelchair and climb the biggest tree in the world. In the Summer of 2001 with the help of many others that dream came True. Hikosaka Toshiko Climbed the Stagg Tree in California and spent the night cradled in the arms of a Giant Sequoia Tree 80 meters above the forest floor. It is from these roots that Tree Climbing Japan was born. 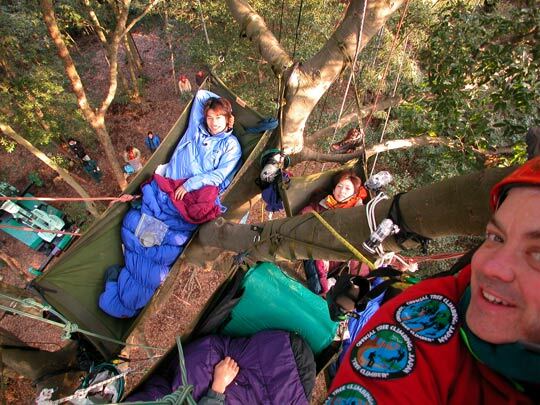 Tree Climbing Japan has grown into a Nation Wide Tree Climbing Organization with two separate Tree Climbing divisions. TreeHab Established in 1998 is a Non-Profit Organization dedicated to helping people better themselves and forests through Therapeutic Tree Climbing and Tree Therapy Programs.